Green Mara is hand quilted in rows of circles tucked at the center. Made of luxury fine high grade cotton for a light airy feel and a soft to the touch fabric. 100% cotton, prewashed, and luxury oversized. 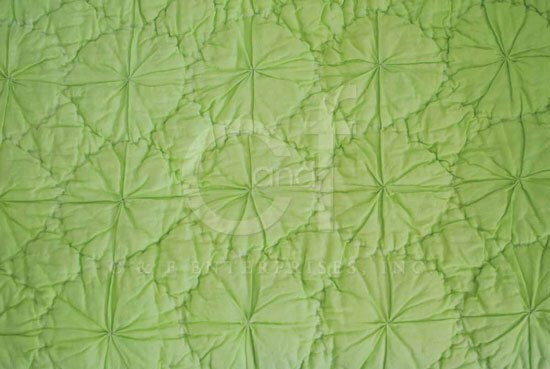 Green Mara Twin Quilt is hand quilted in rows of circles tucked at the center. Made of luxury fine high grade cotton for a light airy feel and a soft to the touch fabric. Cotton filled, prewashed, luxury oversized. 66" x 86". We offer the complete ensemble in the Green Mara line by C & F Enterprises. Green Mara Full/Queen Quilt is hand quilted in rows of circles tucked at the center. Made of luxury fine high grade cotton for a light airy feel and a soft to the touch fabric. Cotton filled, prewashed, luxury oversized. 90" x 92". Fits full and queen size mattresses. We offer the complete ensemble in the Green Mara line by C & F Enterprises. Green Mara King Quilt is hand quilted in rows of circles tucked at the center. Made of luxury fine high grade cotton for a light airy feel and a soft to the touch fabric. Cotton filled, prewashed, luxury oversized. 108" x 92". We offer the complete ensemble in the Green Mara line by C & F Enterprises. Green Mara Standard Sham is hand quilted in rows of circles tucked at the center. Made of luxury fine high grade cotton for a light airy feel and a soft to the touch fabric. 20" x 26". We offer the complete ensemble in the Green Mara line by C & F Enterprises. Green Mara Euro Sham is hand quilted in rows of circles tucked at the center. Made of luxury fine high grade cotton for a light airy feel and a soft to the touch fabric. 26" x 26". Designed to be used behind a standard sham. We offer the complete ensemble in the Green Mara line by C & F Enterprises.